I Love E!’s “Talk Soup” a.k.a. “The Soup”! I’ve missed it since we got rid of cable television almost 2 years ago. But, I get my Joel McHale fix in “Community” via Hulu! I think Joel McHale is a cutie! I don’t care if he has had hair plugs – I think he’s just a big 6’4″ cutie-pie! You know what else are cutie-pies?? These Pops! 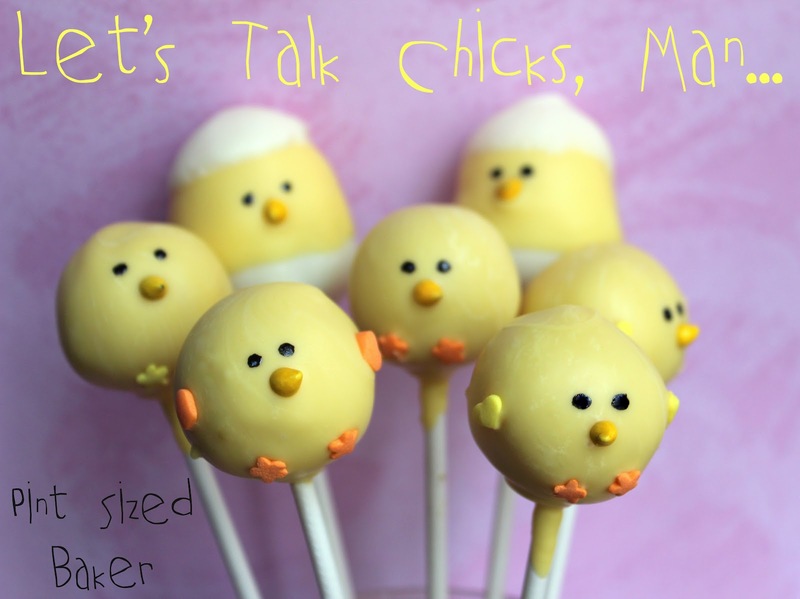 I made some Chick Cake Pops. I started off with some basic cake balls and shaped some into an egg shape. I dipped them and decorated them. To decorate the chicks, I used some flowers for feet, some hearts for the wings and a mini colored chip for the nose. The eyes I dotted on some Wilton’s Cookie Icing in Black with a toothpick. For the Eggs, I just dipped them in white and added the black crack with the Cookie Icing using a toothpick. No real skill is involved in that. Just make a jagged lightning bolt around the egg cake pop. 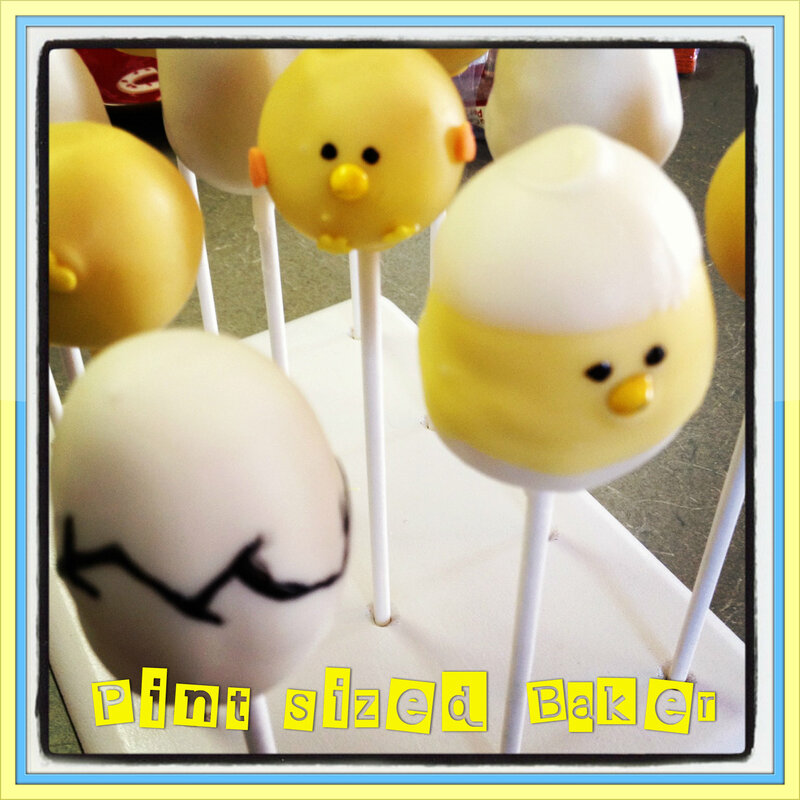 For the “hatching” eggs, I dipped the bottom third of the cake pop in white and then added a stick to the base. Once that was dry, I dipped the top 2/3s of of the pop in yellow. Once dry, dip the top third into the white and then add the features. Enjoy these treats for Easter, or anytime! Love these so much. Thanks for the smiles. Sharing these on facebook too. 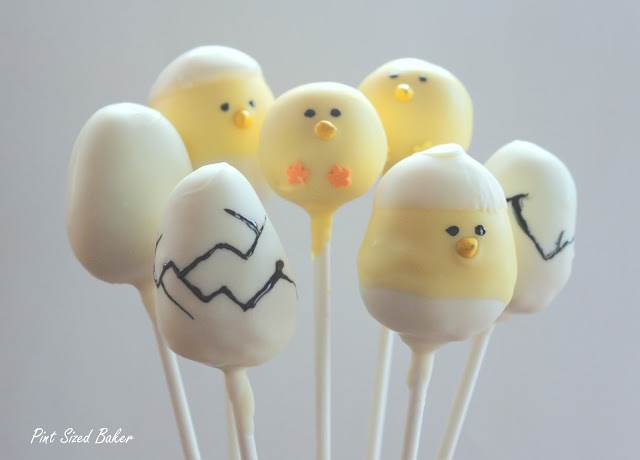 Those are way too cute…I like the ones that are half in and out of the egg shell:-) perfect little treat for Easter!!! I love that show! I totally thought of it as soon as I saw the photo. Love these chicks too, so cute! Wow! These are too cute! I love making cake pops; this is a great spring time cake pop idea. Have you added them to Bakerella, yet? Man oh man…who doesn't love a baby chic on a stick! These are so stinkin cute! I'd love it if you'd share these at Whimsy Wednesdays at http://www.thenymelrosefamily.blogspot.com/2012/03/whimsy-wednesdays-4.html. So cute! I hope you will link this up to my Hippity Hop Easter Project Hop! Wow are those cute! Great job. Come visit us. We have some terrific things to share this week. Oh my goodness these little chickies are SOOOOO CUTE!!!!!! What a fun idea!!!!! the chicks in the eggs are my favorite! These are ADORABLE!! Thanks for the wonderful idea. Will definitely be making some of these for Easter this year! Awww, what sweet little chicks! Your little Chick Pops are just adorable, perfect for Easter. Hope you have a great week end and thank you so much for sharing with Full Plate Thursday. Thank you so much for linking up to the Recipe Party @ The Sweet Spot. These look great! Finally catching up after a long week… Thanks for the feature. At least I got the Thank you on FB in a timely manner… Have a great weekend, Audra! I'll be adding your button! Yes, thank you! I'll be there again on Sunday! These are absolutely adorable. I love them. Darling! 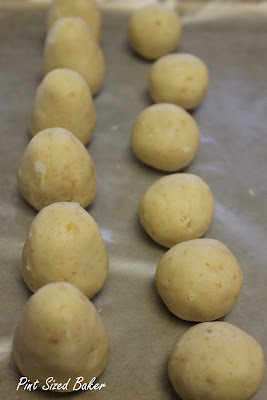 I'm going to attempt my first cake pops this week…wish me luck! Good Luck! Word of advice, start off with 1/4 of the cake and a tablespoon of frosting. You should get 10 – 12 cake pops. Start off small and don't give up. If those first dozen work out, then move on the rest of the cake, or freeze it for another day. Take your time melting the chocolate. Patience is key in melting and stirring to get the right consistency. If you need help, send me an e-mail PintSizedBaker@gmail.com. I love that you had the chick in different stages coming out of the egg. I think my favorite is the egg cracked. Thanks so much for sharing at Whimsy Wednesdays. These are SO adorable! 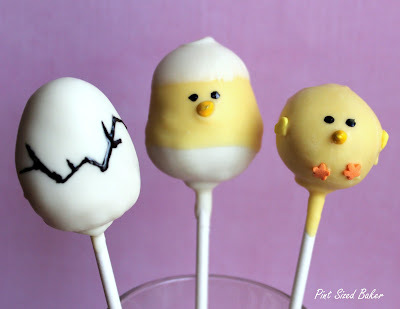 I haven't made cake pops yet but looking at these little cuties I really want to now.